Update, May 8: Both Samsung and HTC updated the software on their flagships and improved the camera, so we recorded new samples, made new crops and updated this page. 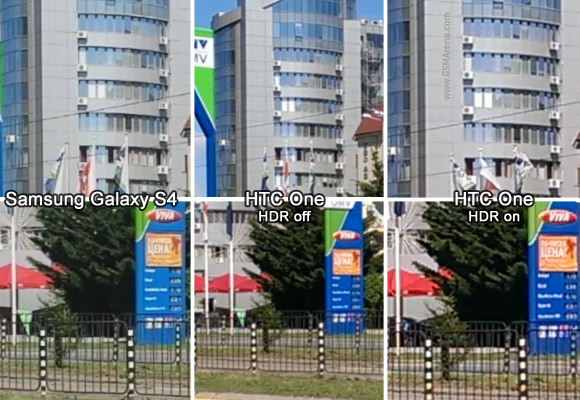 Both the Samsung Galaxy S4 and the HTC One shoot 1080p videos at 30fps. The bitrate for the Samsung smartphone is typically between 16Mbps and 17Mbps with stereo audio making up 128Kbps of that. The HTC One goes higher with bitrates of 19Mpbs - 20Mbps and audio bitrate of 196Kbps. The difference is Field of View is pretty noticeable - the Galaxy S4 fits less in the frame than the One and even the Galaxy S III. The difference in image quality between the two handsets is surprisingly small considering the gap between them in still photography. 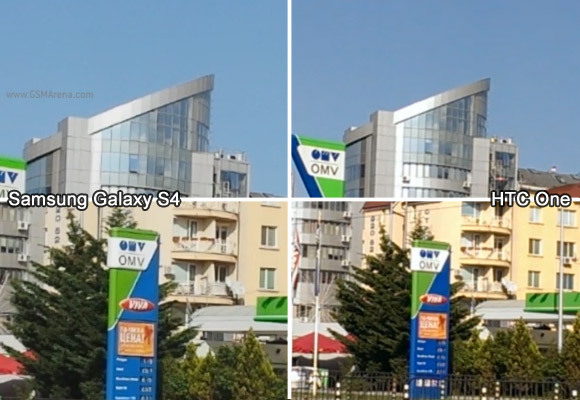 The level of fine detail in both videos is comparable, which is some achievement by HTC, considering the wider FoV of the One (meaning that at the same resolution, each object is drawn with fewer pixels, but more of the scene fits into the shot). The One also did a good job at preserving detail in lighter areas of the image (the top of the building) and had better contrast in its videos. The shadows are slightly underexposed though. The Galaxy S4, on the other hand, offers better color accuracy (the cloud looks purple in the HTC One video) and slightly better dynamic range. 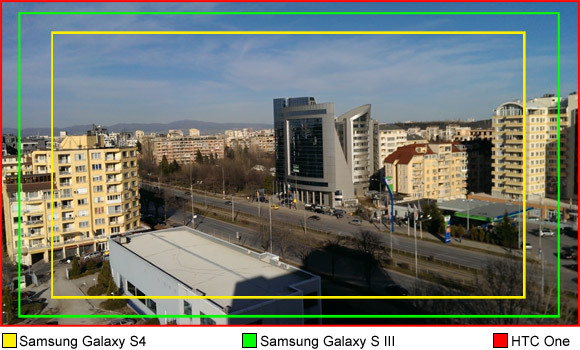 Update, May 8: Things seem to be the same here - fine detail is comparable(an advantage for the HTC One, which has a wider FoV), while the Samsung Galaxy S4 offers better dynamic range and colors more accurate. Here are the FullHD video samples used to make the crops above. Upadte, May 10: The HTC One also has an HDR video mode, but the effect is quite subtle overall. Note that the FoV gets a bit narrower when in HDR mode and the colors become a bit dull. The two phones are in our Video quality comparison data base too. 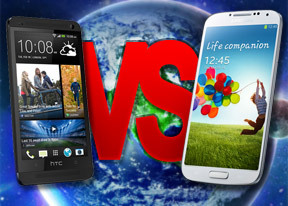 Winner: HTC One. The HTC One takes this round thanks to its much wider field of view and OIS. The Samsung Galaxy S4 can shoot great videos too, as long as you have steady hands and have enough room to take a step back.